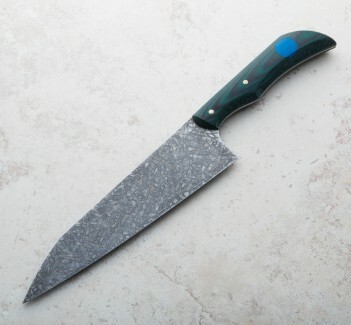 In 52100 carbon steel with a full distal taper and beautifully contoured spine and choil, this 130mm / 5.12" utility blade is thin and sharp, coming to an especially fine tip for detail work while providing ample stiffness at the same time for more demanding cutting tasks. 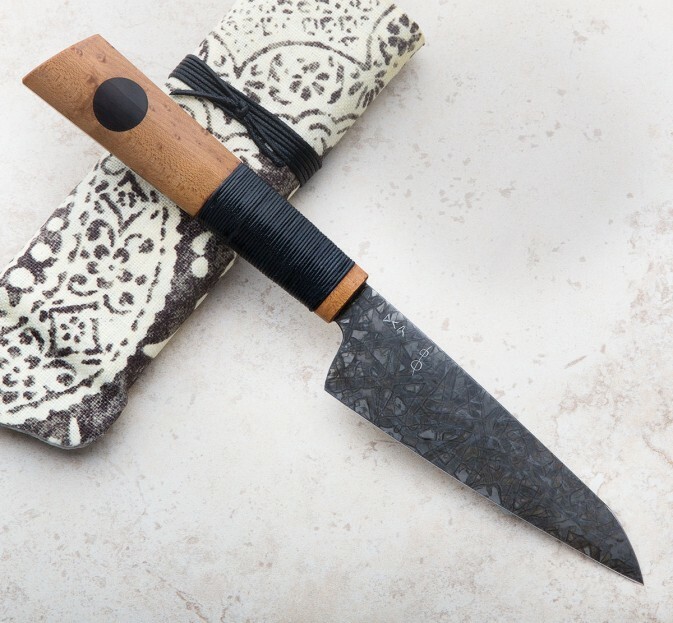 The forced mustard patina adds a bit of extra protection to this already resilient and well-loved steel, and of course it looks amazing as well. 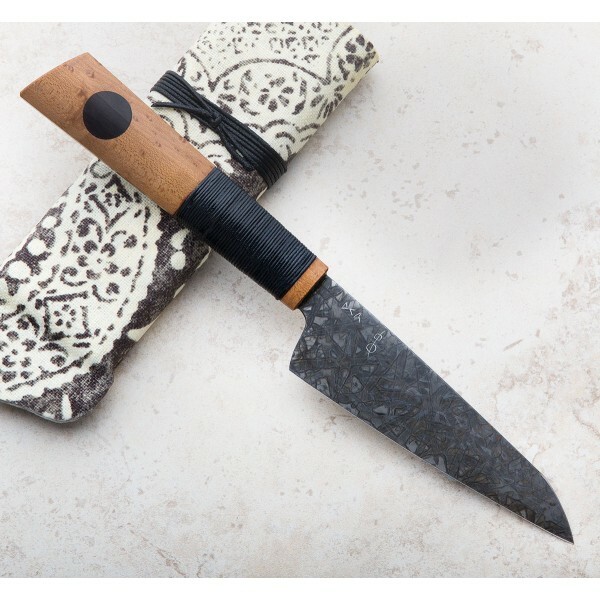 Handcrafted by Don Carlos Andrade, the knife is dressed in maple wood with a blackwood inlay and rosen-impregnated cotton tribal wrap. A cloth covered protective case is included. Don Carlos Andrade's extraordinary eye for beautiful and timeless design coupled with his more than two decades of experience carving, forging and bladesmithing, results in stunning tools like this Tribal Utility Chef knife. 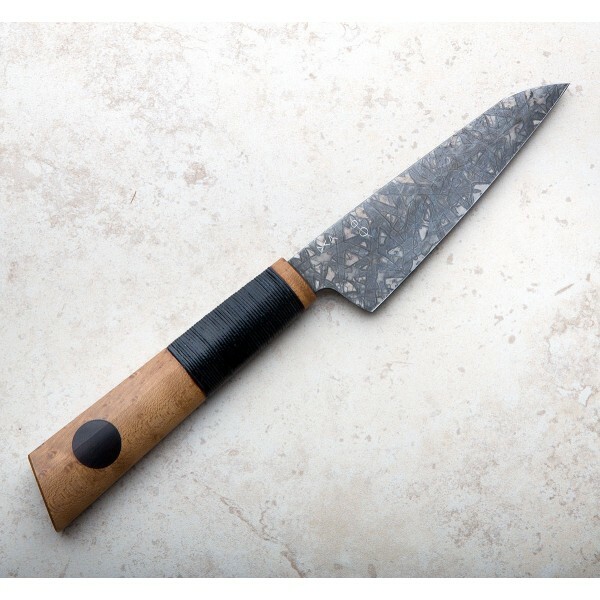 Made for professional and home cooks alike, Don's heirloom quality tools are made with love and an attention to detail not often seen, each knife a work of art from a world-class artisan. Blade length: 130mm / 5.12". Overall length: 285mm / 11.2". Blade width at choil: 3.0mm. Blade wiidth 1" from tip: 1.6mm. Blade height at tallest point: 38mm. Weight: 4.2oz / 120g. Blade hardness: 59-60 HRC.